There are times when imagining the worst-case scenario helps you prepare most effectively for the best case. The transition of a family or closely-held business is one of those times. Ask yourself, why is it that while Harvard Business School reports at least half of all companies in the US are family businesses - and just over half of all publicly listed companies in the US are family owned - that the most-cited family business statistic is from John Ward’s seminal study finding only 30% of firms survive through the second generation, 13% survive the third generation, and only 3% survive beyond that? The Family Business Institute identifies a major cause as the failure to imagine and plan for worst-case situations that could dramatically affect not only ownership succession, but management succession planning and leadership development as well. You could start with the classic movie, “The Lion in Winter”, which is an inspired lesson in how not to transfer a family business from one generation to the next. Peter O’Toole, as an aging King Henry II, spars with his calculating queen, played by Katharine Hepburn, over which of their three sons will inherit the throne. But you do not need to look to Hollywood for unhappy examples. Imagine the impact of any of the following all-too common situations on your own small business and family. The current 40-something year-old second generation business leader is suddenly given a life-threatening diagnosis or another serious illness, making it too late to purchase disability income or life insurance that could provide funds to hire a seasoned manager or support their immediate family. Your top salesperson is a member of the family business through marriage, then there is an ugly divorce that leaves the business without the industry contacts and relationships to sustain your sales pipeline. After the unexpected death of a key investor, you discover this business partner’s heir is a 17-year-old with a full-blown substance abuse problem. Over the years, I have seen each of these situations unfold. I also see over and over again, the same common obstacles to planning for a business transition. Founder-itis. In contrast to publicly owned firms where the average CEO tenure is six years, many family businesses have the same leaders for 20 or 25 years, and these extended tenures can increase the difficulties of coping with shifts in technology, business models, and consumer behavior. While the founder of the business may officially ‘retire,’ actually letting go on a daily basis can be difficult. Avoidance. Your life is full. Family dynamics are complicated. At the end of a long day, it can be easier to convince yourself that nothing bad will happen than it is to raise difficult issues with family members, especially across multiple generations. Culture versus business myth. Many small business owners seem to believe in an either/or approach to management and business operations. Either the business culture maintains a warm, informal approach to day-to-day operations with a tightly knit group of long-time employees (like a ‘family’) — or, there are formal processes, procedures and a chain of command in place (like a ‘business’). Yet there is nothing inherently antithetical to sustaining a positive and unique business culture in having a clearly defined chain of command, SOPs (standard operating procedures), or investor clauses in your bylaws. For evidence, look at the consistent winners in the annual “Best Places to Work” lists. The plenty of time myth. Business transitions take longer than you may think. After you have decided where you are headed, it will take another 2-5 years to prepare a small business for transition either to the next generation, or for sale to an outside buyer. Sales to a third party are usually less complicated than intergenerational sales. 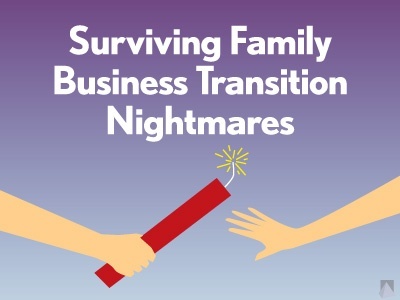 A five-step approach can help to avoid a nightmare family business transition. Involving multiple generations and maintaining open communication throughout the process is the ideal, however some families find success with one internal champion who takes the lead on doing the ‘homework’ and presents findings to other business family members for decision-making at scheduled planning retreats. What if, one of the founders or next-generation managers suddenly fell gravely ill? What if, this or that major investor or partner needed cash and pulled out of the business quickly? What if, this or that key employee decided to leave the organization? Rank in order the impact of each scenario risk or outcome for your family, your business, and key non-family member employees. Explore the business transition planning tools and options available for you, the business and your family with your financial advisor, an attorney, and other professionals on your team. Estate planning, tax planning and leadership development need to be in sync. You want to understand the time frame and the cost to implement each. Based on the risk, timing, and cost assessment for each option, develop a work plan and schedule to tackle and resolve the major risks over the next twelve months. Remember that transitions do not happen automatically. With the major risks minimized, continue to work on implementing the planned change in roles and operations, so both the older and younger generations, - and key employees - know the details about how the business runs and what to expect in the future business transition. Ward, J. (1987). Keeping the family business healthy. San Francisco, CA: Jossey-Bass. Heidi Clute, CFP® of Clute Wealth Management in South Burlington, VT and Plattsburgh, NY, an independent firm and registered investment advisor that provides strategic financial and investment planning for individuals and small businesses in the Lake Champlain Valley region. The opinions voiced in this material are for general information only and not intended to provide specific advice or recommendations. For a list of states in which we are registered to do business, please visit www.clutewealthmanagement.com.